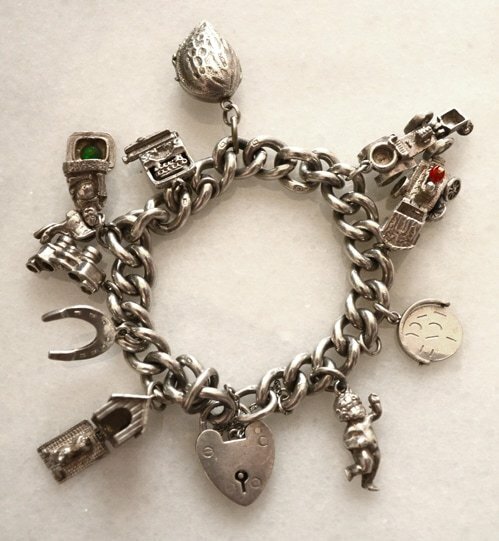 A charm bracelet plays a significant role in my 1950s coming-of-age romance Tomboy. My main character, Harriet, wears one throughout the decade, adding new trinkets and switching some out as her life changes. I’m not a child of the fifties, but I also wore a charm bracelet when I was a kid. I don’t remember why I started—probably my older sister got one and I wanted to be like her—but I do remember searching for charms to add to it. My finds included a pewter lantern, a small Virgin Mary medallion that my brother picked up for me at the Vatican, and souvenir charms from places we’d visited, like the Eiffel Tower. Occasionally I’d win one from a Christmas cracker. Photo by Vintage Jewellery UK. Used via a Creative Commons 3.0 license. The history of charm bracelets goes back at least two thousand years to the Middle East and Arabian Peninsula. In the modern era, Queen Victoria of the United Kingdom helped popularize them during her reign from 1837 to 1901 by wearing them often and giving them as gifts. But it wasn’t until after World War II that they took off in the United States, as many American soldiers returned home with souvenir trinkets from the places they had served in Europe and the Pacific. Their daughters and sweethearts needed some way to wear them, and a trend was born. American jewelers soon began creating charms of their own to take advantage of the rising middle class’s disposable income. Soon, there were charms for commemorating just about any life event. 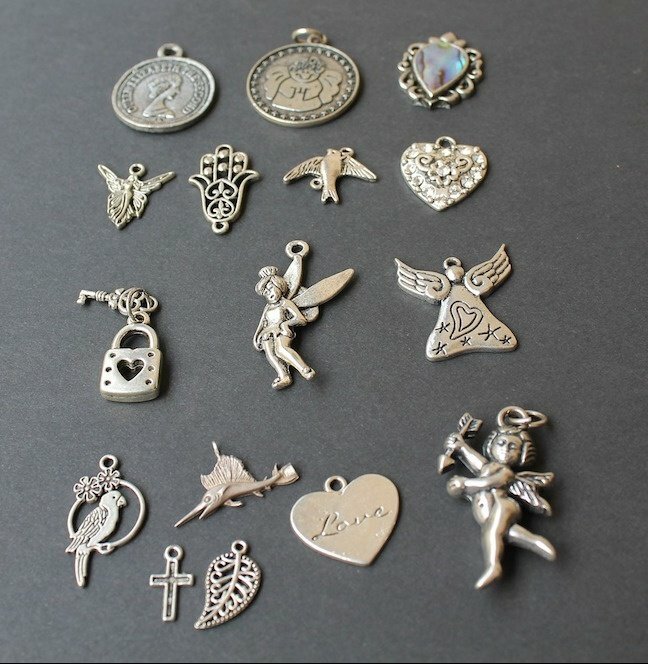 A variety of charms, old and new. Photo by Daniel Albany. In Tomboy, Harriet’s charm bracelet starts out simple with a saucepan charm her mother gave her to commemorate her learning the basics of cooking. On a summer trip to Washington, D.C., she picks up miniature replicas of each monument to add to her bracelet. Her parents give her a puffy silver heart for one of her birthdays. She buys a revolver charm after developing a crush on Miss Kitty, the saloon owner in the show Gunsmoke. 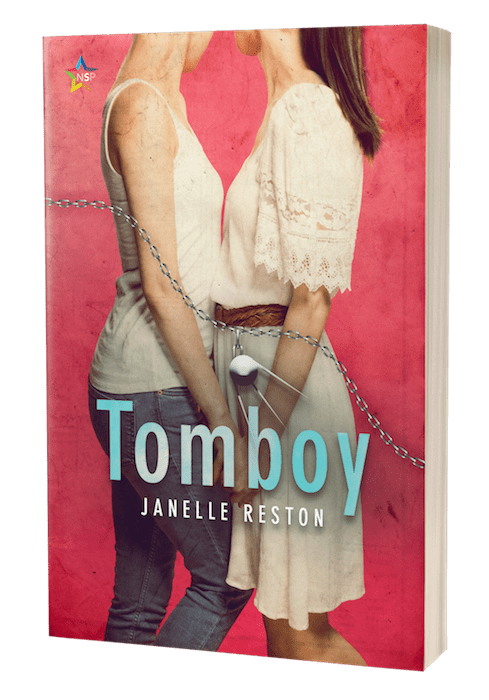 Her friend Jackie brings Harriet a turquoise charm from her visit to the Southwest, and later gives her a replica of Sputnik, the first artificial satellite to be successfully launched into outer space.